On 01/15/19 at approximately 1120 hours, Arturo Rosa Padilla turned himself into Morgan Hill Police without incident. Padilla was booked on six counts of child molestation and later transported to the Santa Clara County Main Jail. In November 2018, a report of a suspected sexual assault on a minor was reported to the Morgan Hill Police Department. An investigation into the allegation resulted in the Santa Clara County District Attorney’s Office filing multiple counts of sexual assault on a minor under the age of 14 years. 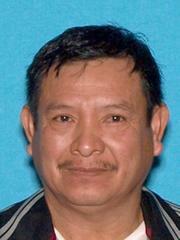 A felony arrest warrant was issued for 57 year-old Arturo Rosas Padilla of Morgan Hill. MHPD has made multiple attempts to locate Padilla but he is currently outstanding. Padilla is known to frequent Morgan Hill, San Jose and Fremont. MHPD is requesting your help in locating Padilla. Anyone that may have additional information related to this incident or the current suspect location is encouraged to contact Detective Chris Woodrow at (669) 253-4895 or the anonymous tip line 408.947-STOP (7867).